Related to Projects and Tasks. When I select Project in Calendar and go to Task drop down I have all tasks there. How to make dropdown that contains only Tasks related to selected in column B Project? A drawback to using project and task drop-downs in the calendar sheet is that maintaining valid input is tricky. For example, if you select a matching project/task pair and then change the project, the task is technically invalid. What should happen in that case? Note, this is not a problem specific to Google Sheets, but rather a general computer programming problem. A simpler and error-free approach is to combine the two drop-downs into one so that only valid project/task pairs can be selected. And, it so happens to be easier to implement than synchronized drop-downs anyway! 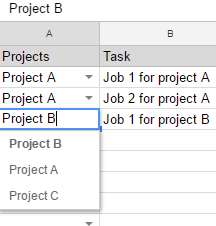 Add a new column to the tasks sheet which concatenates the project and task columns. Here's an example formula: =concat(A1, concat(": ", B1)). The output looks like this: Project A: Job 1 for project A. Use the new column in the tasks sheet as the data-validation criteria for you task column in the calendar sheet. Delete the project column from the calendar sheet. Hence, it's impossible to mismatch the project and task. How do I create a data validation function to print the values of a specified column across all pages?